US Senate Minority Leader Harry Reid says he won’t seek re-election when his current term expires in 2016, ending a 30-year run that made him the top-ranking congressional Democrat under President Barack Obama. Sen. Reid (D-Nevada), 75, said in a video released Friday that he won’t be running in the 2016 election, eliminating any possibility of a sixth term in the Senate for the lawmaker. "I have had time to ponder and to think. 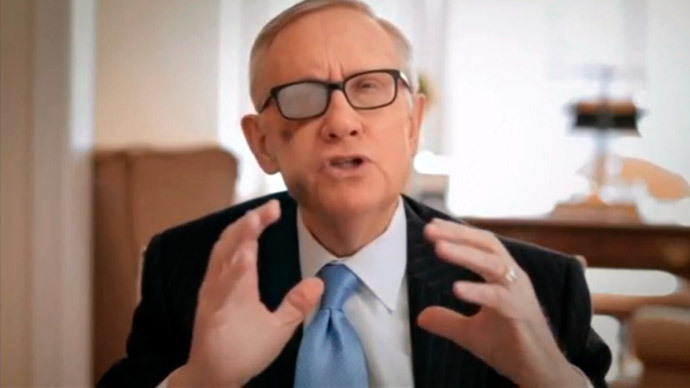 We've got to be more concerned about the country, the Senate, the state of Nevada than ourselves," Reid said. "And as a result of that I'm not going to run for re-election." After a single four-year term in the US House representing his home state of Nevada, Reid was successfully elected to the Senate in 1986. He began serving as majority leader after Democrats gained control of the Senate following the 2006 elections, but lost that title when the Republican Party took hold of the chamber earlier this year and installed Sen. Mitch McConnell (R-Kentucky) as majority leader. Citing the need for Democrats to reclaim control in 2016, Reid said Friday that he believes it would be “inappropriate” for him to soak up the party’s resources when they could be better spent on ensuring the caucus can usurp the GOP from power. "We have to make sure that the Democrats take control of the Senate again," he said. In his video, Reid warned Senate Majority Leader Mitch McConnell that Republicans shouldn’t consider his decision not to seek re-election as a premature win for the GOP ahead of 2016. "Don't be too elated. I am going to be here for 22 months ... doing the same thing I've done since I first came to the Senate,” Reid said in a personal message to McConnell in the video. Nevertheless, some members of the GOP are already hailing Friday’s announcement as a win for the Republican Party. With regard to what Reid’s departure from the Senate could mean for his home state, Sen. Jon Tester (D-Montana), the chairman of the party’s Senatorial Campaign Committee, said Democrats needn’t worry. "There is a talented pool of Nevada Democrats who are ready to step up to the plate, and we will recruit a top-notch candidate in Nevada who will be successful in holding this seat in 2016," Tester said in a statement.